Now is your chance to participate in the most exciting underwater experience ever! No prior snorkeling or scuba diving experience is required. Enjoy the breath-taking beauty of natural reefs, plant and marine life on your own personal submarine, the BOB (Breathing Observation Bubble). 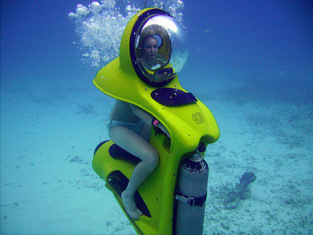 It is like an underwater moped with a bubble helmet so your whole head is out of the water. Featured on the Discovery Channel, the BOB is propelled by an electric motor and allows each passenger to enjoy the underwater world to a depth of 24 feet for up to 35 minutes. Other restrictions: Participants cannot be suffering from asthma, epilepsy, have pacemakers, recent heart attack, or are pregnant.